This one is an oldie but a goodie for me. I clipped the recipe many years ago from Kraft’s Food and Family magazine and have made it many times. Heat oven to 350 degrees F. Line a 13 x 9-inch pan with foil, with the ends of foil extending over the sides; grease foil using pan spray. 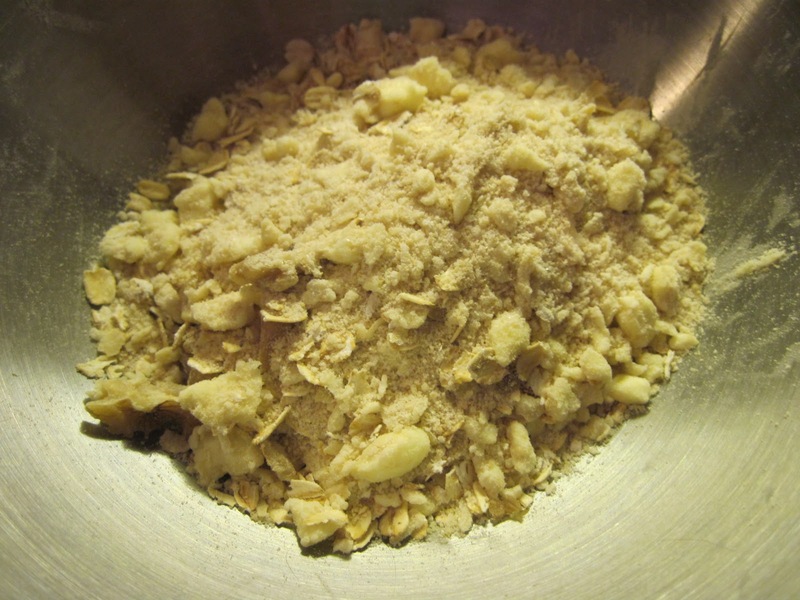 Mix flour, 1/4 cup sugar and all the brown sugar in a medium sugar; cut in the cold butter using a pastry blender or 2 knives until the mixture resembles coarse crumbs. 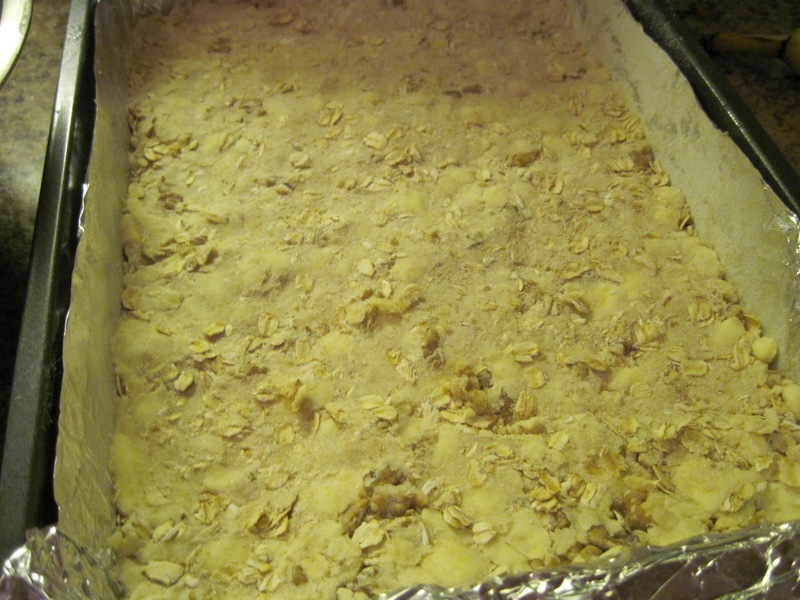 Stir in the oats and nuts. 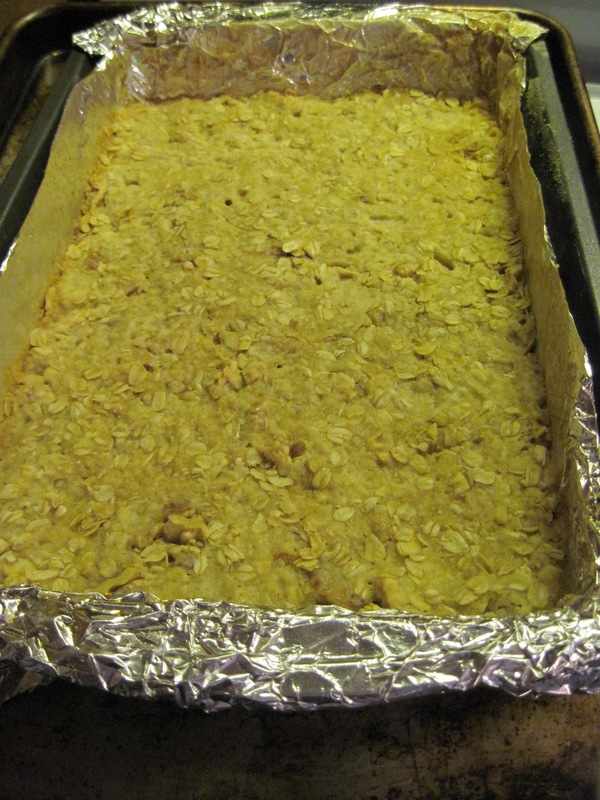 Reserve 1 cup of the oat mixture; press the remaining mixture into the bottom of the prepared pan. Bake 15 minutes. 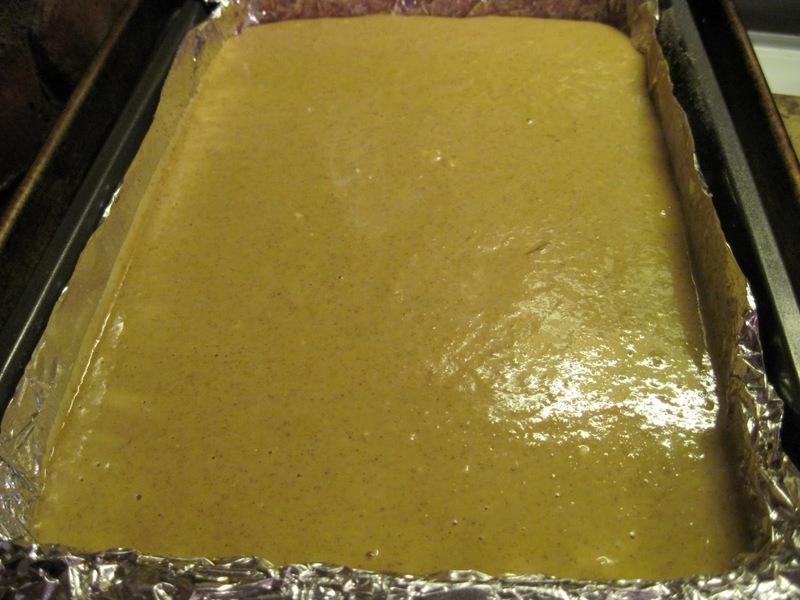 Beat cream cheese, remaining sugar, eggs, pumpkin and spice with mixer until well blended. 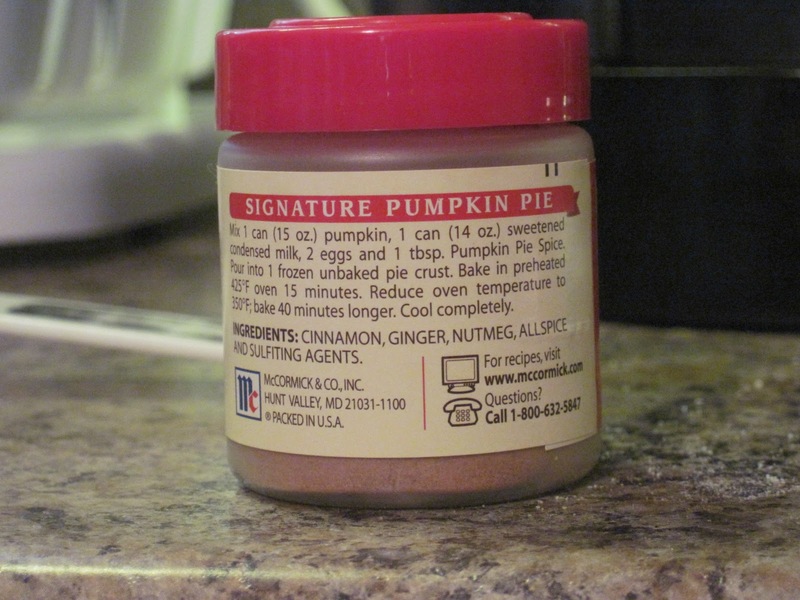 *If you don’t have pumpkin pie spice, feel free to substitute a mixture of equal amounts of cinnamon, ginger, nutmeg and allspice (or use whatever proportions and whichever of those spices you prefer). 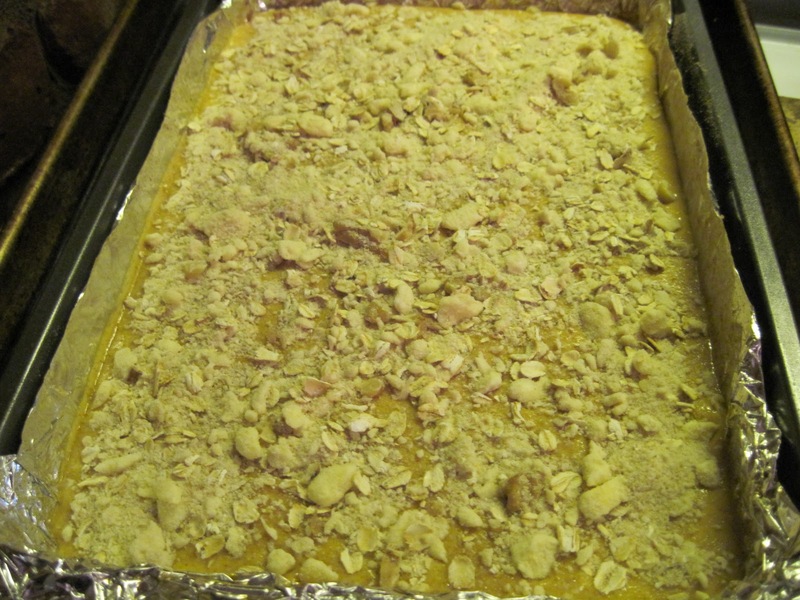 … then sprinkle top with reserved crumb mixture. Bake for 25 minutes, then cool for 10 minutes. Use the foil overhang to lift the dessert out of the pan and place on a wire rack to cool completely before cutting. Cut into 24 bars to serve. 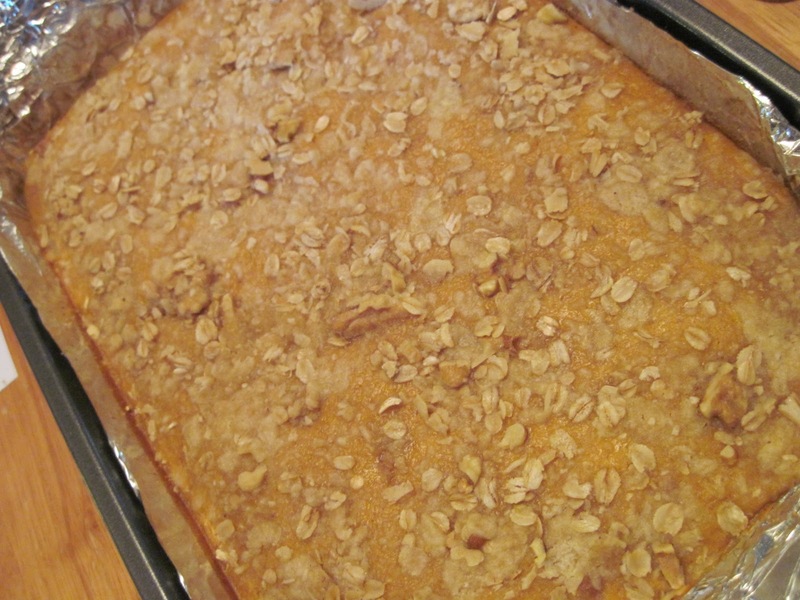 I love making these in the fall — the creamy pumpkin custard marries well with the chewy sweetness of the oat/nut streusel and the buttery bottom crust. It’s terrific for a little pumpkin pie fix! Here are just a few of the things I’ve baked the past few months. There’s so much more than I just didn’t have time or forgot to photograph — sorry. Practicing Palmiers at home for my Classic Pastry practical back in October. I blame the cheap butter. 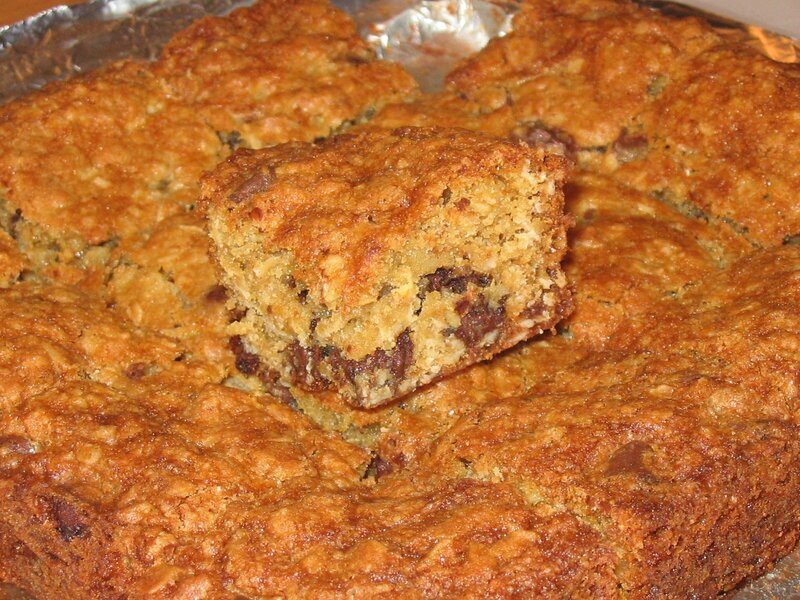 Some sort of chocolate chip bar cookie… not for school. I honestly can’t remember what they were or where the recipe came from. 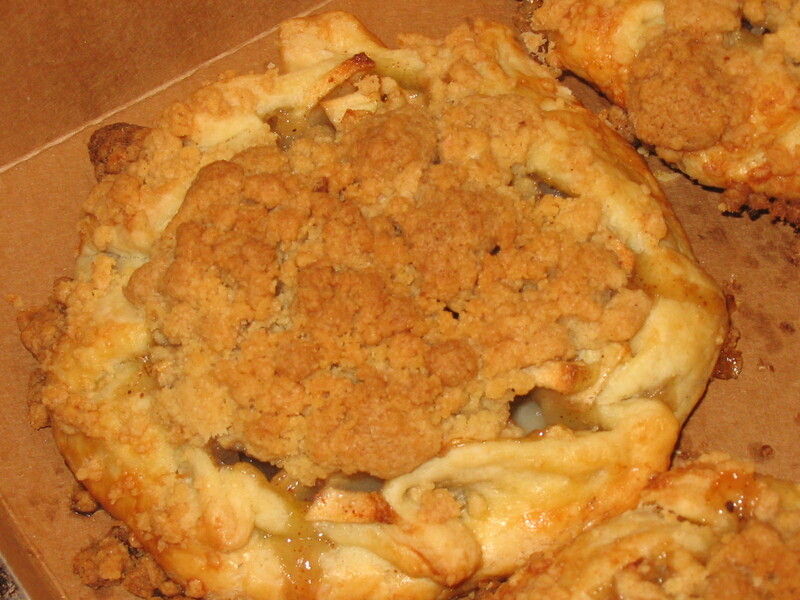 Dutch Apple Galette, from first day of Pies and Tarts class. 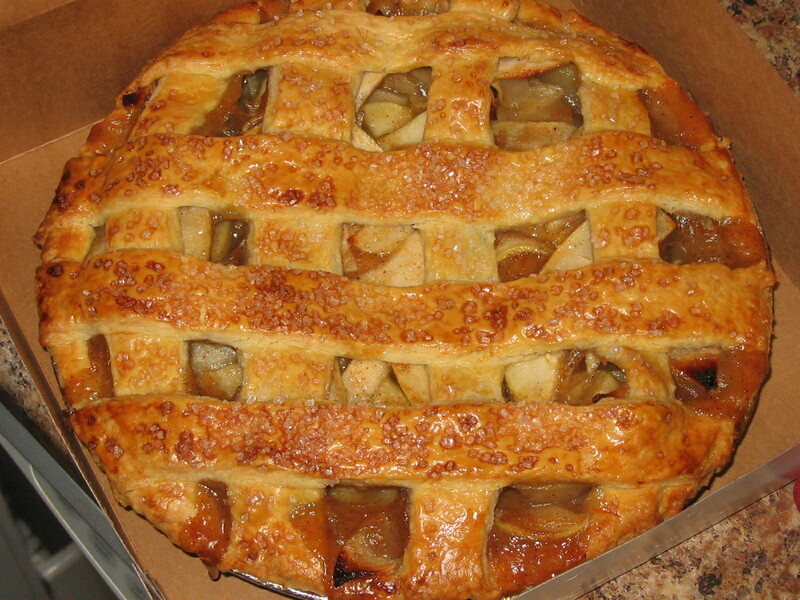 Lattice Apple Pie, also from Pies and Tarts class. Ungarnished but partially eaten Turtle Pie. 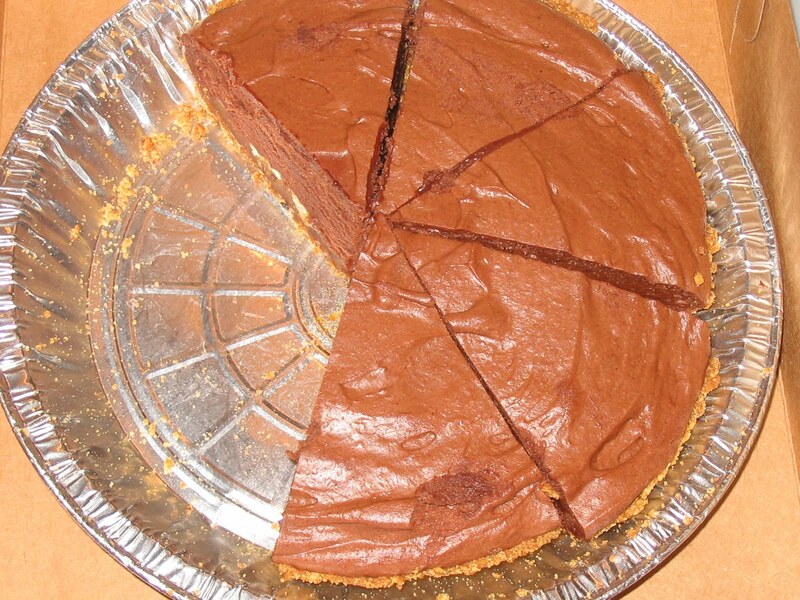 Chocolate Cream Pie — a big hit with the kids at Thanksgiving. 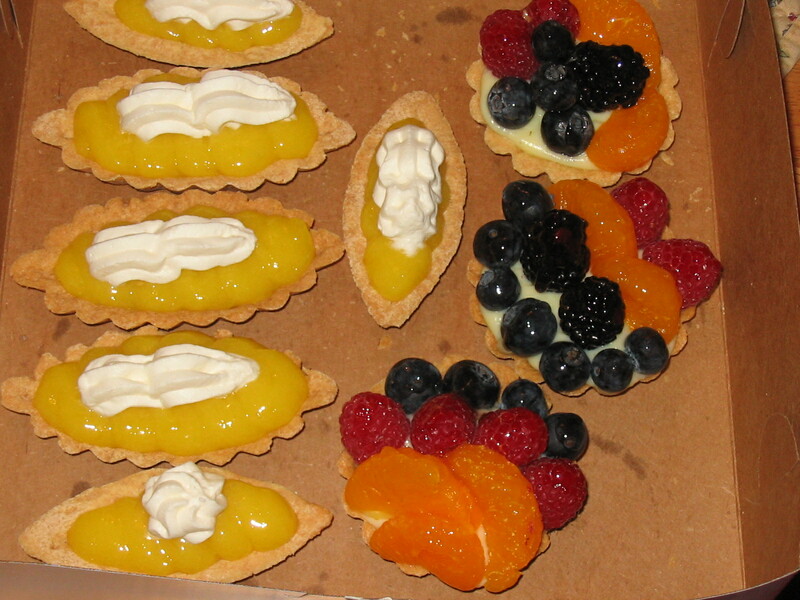 Lemon Curd Tartlets (my favorite) and Fruit Tartlets. 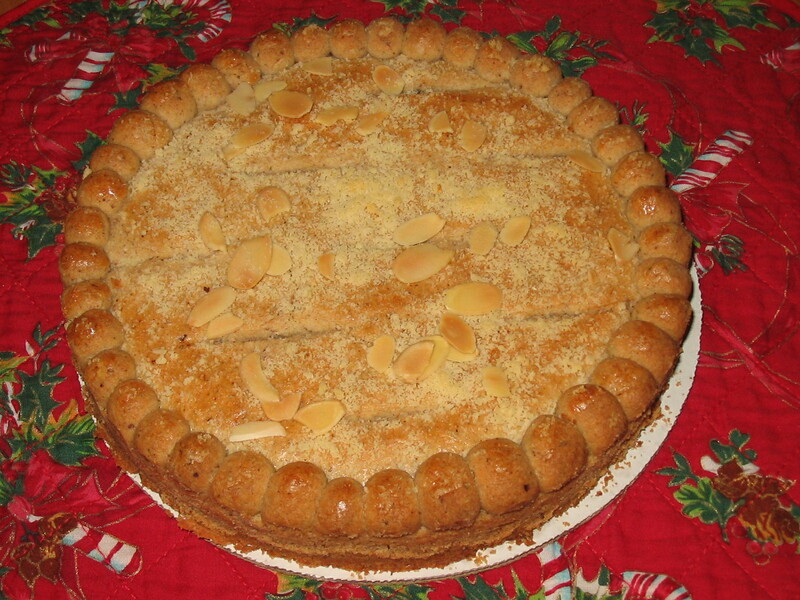 This is actually from the first day of Winter Trimester — Linzer Torte from Cookies and Petit Fours class. Chocolate chips and oatmeal are always a winning combo for me. In fact, I love oatmeal in almost any cookie, but I’m not sure everyone does, and chocolate can certainly make it more palatable for those folks. Oat bran/fiber AND chocolate? How can you lose? Usually when I bake goodies for L.’s teen gatherings, a few come home, so I wasn’t too concerned that I wouldn’t get to sample one later. However, this time there were no leftovers at all. So you’ll have to take L. and friends’ collective word for it that they were delicious. The recipe was from Nestle’s Very Best Baking site, and they were a snap to make and contained ingredients that most bakers have handy — which was a very good thing for me since I had forgotten to pick up a snack at the grocery store for L. to take! I’m trying to get caught up with my blog posts — it’s been really busy this week and while I continue to bake, I just haven’t had time to post. Michael Ruhlman is an author, food writer and blogger. His latest book, Ratio, has quite the buzz going in foodie circles right now. I haven’t read it yet, but it’s on my list. He recently wrote a post about his disdain over the use of boxed lemon square mixes. 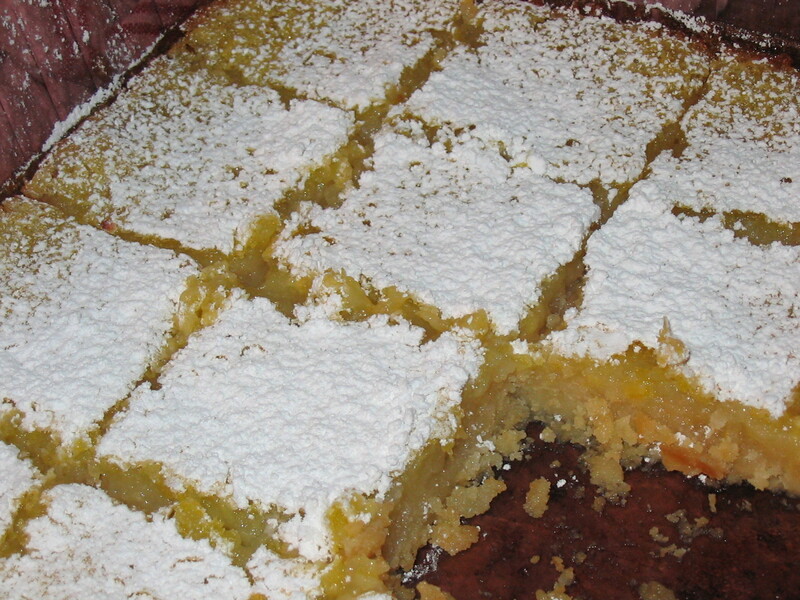 I have to confess, I’ve only ever made lemon squares from a mix — and I thought they were pretty good. But it’s been a few years and I now try to not use boxed baking mixes at all and his post inspired me to make them for Easter. 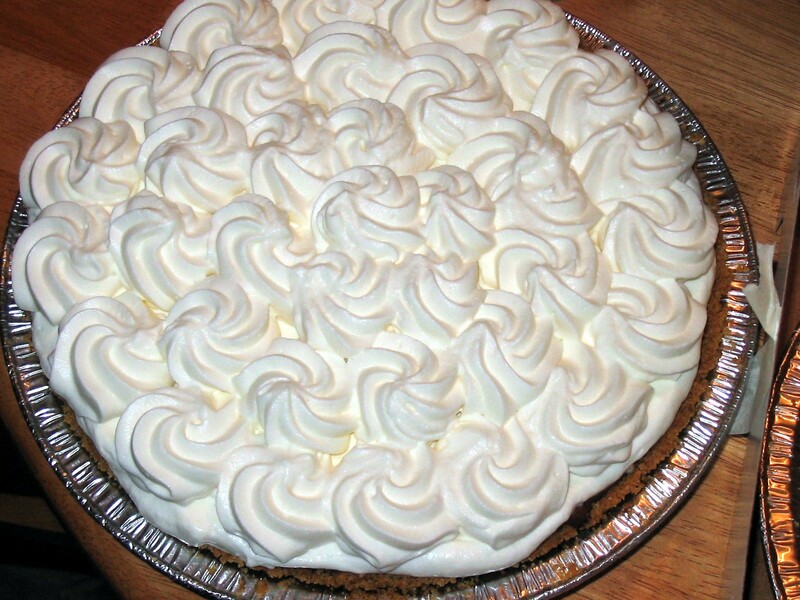 Actually, if it were a perfect world, I would’ve baked a lemon meringue pie but my last attempt was so abysmal I thought it best not to (I can’t get the meringue to not weep, and that makes me weep). Lemon squares are an acceptable substitute. Ruhlman’s lemon squares (actually Susan Ziegler’s, his childhood neighbor) are equal parts base and curd. He says one can tweak the balance as one sees fit, but 50/50 is fine with me. The finished lemon squares were a little fragile but had terrific flavor — tangy, sweet, buttery. I loved the shortbread quality of the base, and by Day 2 the base had acquired a little bit of a very pleasant crunchiness. 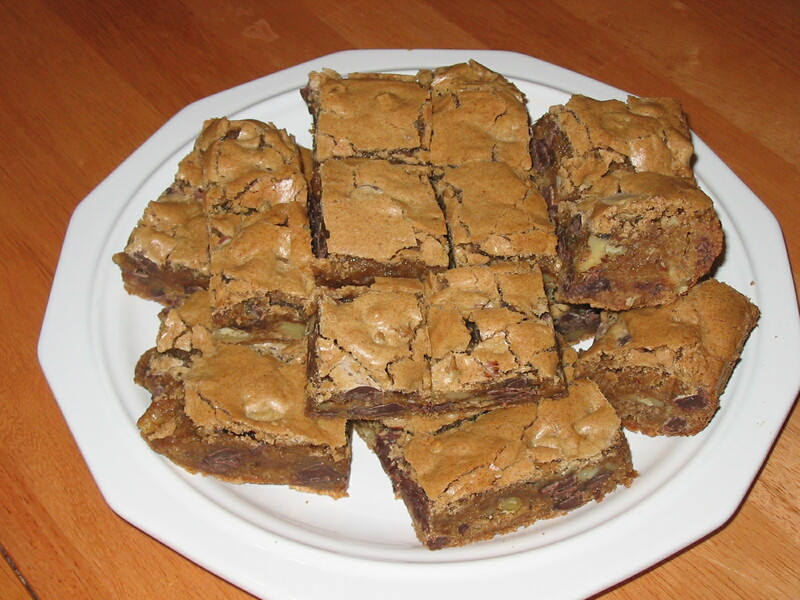 The recipe makes 16 fairly small squares, so if I were planning on making enough to share I’d make a second pan. I needed a snack to send for another of L.’s teen gatherings and found half bags of milk chocolate toffee bits and milk chocolate chips in my pantry. A few minutes of trolling the Internet and I came up with this easy recipe from Relish Magazine, which is apparently a food publication carried by some newspapers (not mine). The recipe is actually for Butterscotch Toffee Squares, but I only had about 2/3 cups of toffee bits (it calls for a cup) so I supplemented it with milk chocolate chips. These bars almost didn’t make it to their destination! After I cut them up, I had to sample one (I told myself it was for quality control, but the truth is I’m a sucker for anything butterscotch or toffee) and of course, L., being his mother’s son, had to try one too. They were chewy but a little crunchy (we had the edge pieces) and sweet and butterscotchy and just soooooo good. The recipe only makes an 8″ x 8″ pan so after sampling there were only 14 pieces remaining and it just didn’t make sense to send in so little. And they always have too many snacks at those gatherings anyway. Surely they wouldn’t miss my little contribution? But cooler heads prevailed — P. told me to box them up and send them on their way. Sadly, there were no leftovers at the end of the evening for L. to bring home. Now I will have to go out and buy more toffee bits so I can make a pan for myself! Due to incredibly poor planning, I had to go to the local warehouse store and the grocery store on Monday, 2 days before Christmas Eve. This is not something I normally aim to do because it seems that on Christmas week, food stores are suddenly filled with the shopping-challenged — there are the people who have never been in a grocery store (“oh my goodness, Herb, look at all the different salad dressings!”), those who don’t know basic shopping carriage etiquette (they are not meant for plowing into fellow shoppers), and my favorite, the folks who believe that if I am looking at a shelf of food, this means that they should then step in between me and the shelf to consider the choices for themselves. So after I returned home from nightmare that was food shopping on Monday, my very dear sister-in-law called me to request something desserty for Christmas dinner. I was torn between steeling myself to go back out into the throng (it IS Christmas, after all) or being practical (and hopefully not too Scroogish) and combing my cookbooks and the Internet until I found something festive I could make with what I had at home. To be fair, my kitchen is not exactly spartan — I had about 25 pounds of assorted types of flour, 10 pounds of different kinds of sugars, 5 pounds of different types of baking chocolate, all sorts of nuts and so on. 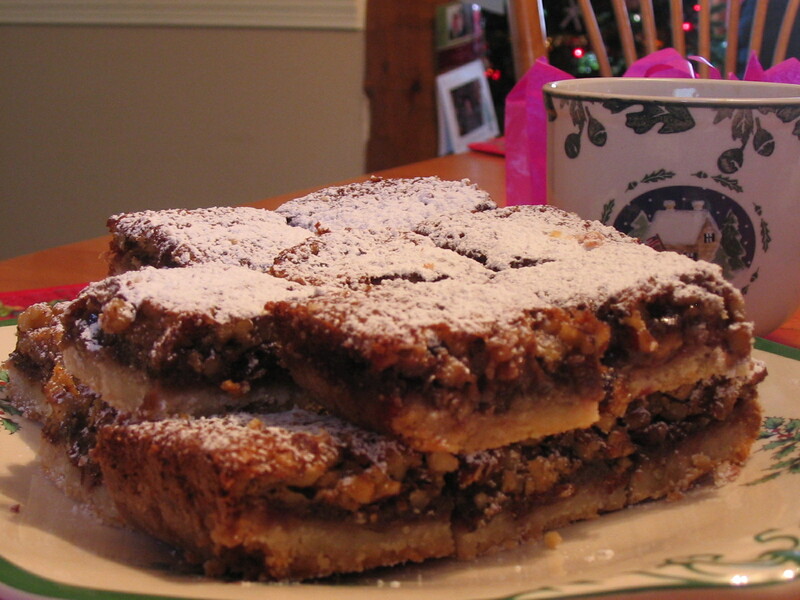 In the end, I opted to make these raspberry shortbread bars, which I found in a community cookbook. I knew my SIL had made fudge and I figured that the shortbread would counterbalance the chocolate nicely (and to be honest, it’s been a chocolate-filled month for me, and (insert shock and horror here) I was getting pretty sick of all things chocolate. To prepare the shortbread base, prepare the 1 1/4 cup of flour and 1/2 cup sugar in a bowl; cut in butter until the mixture is resembles fine bread crumbs. Press the mixture firmly into bottom of a lightly greased 9″ square baking pan to make an even layer (I used the bottom of a glass to pack it down tightly). 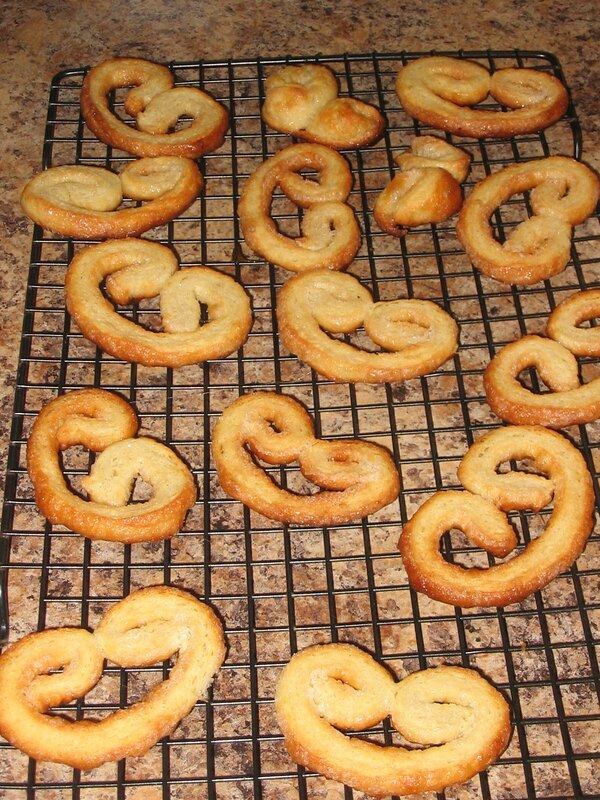 Bake for 350 degrees for 20 minutes or just until the edges have become lightly browned. Remove pan from oven and spread the raspberry jam over the shortbread. Beat eggs with brown sugar and vanilla until well blended. Mix the 2 tablespoons of flour with the salt and baking soda and it all to the egg/brown sugar/vanilla. Add nuts. Spoon the mixture over the jam and spread lightly to the edges. Return pan to oven and bake for 25 minutes longer or until the top is set. 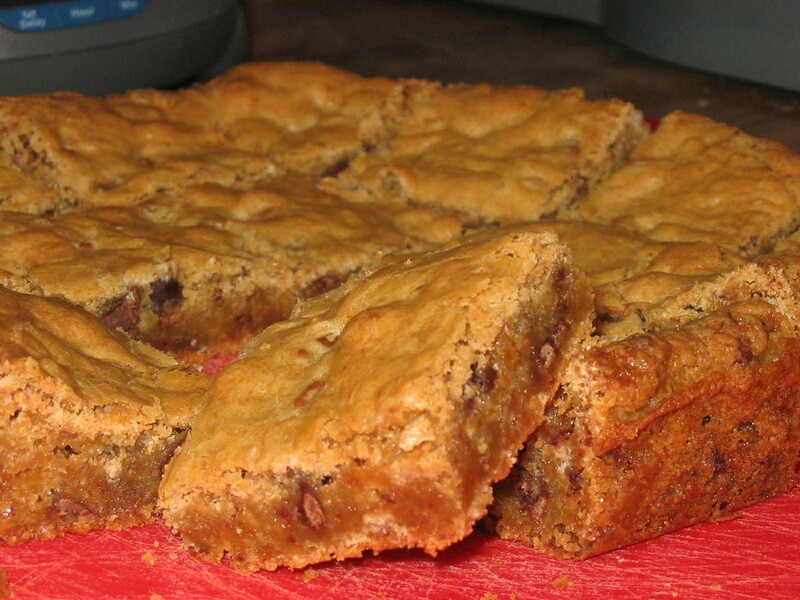 Cool in pan and then cut into bars. Makes 24 bars. The sprinkled confectioners’ sugar is to camoflage the overbrowning (I used half dark brown sugar when I ran out of light brown sugar halfway through measuring). On a side note: I am so done with sweets. Thank goodness Christmas is here so I can go back to bread baking! Merry Christmas to all! A lot of people prepare family favorites during the holidays, as a tradition, or even just as a way to connect with loved ones. I don’t have much in my holiday baking repetoire that fits that category. Living in Bangkok with my mother, we weren’t really in the practice of baking holiday goodies at Christmastime. And when I was with my father in the States, holiday baking was just not one of his traditions. When I was a teenager, my father was married to a woman who loved all things peanut butter. At holiday time she’d make peanut brittle (and a few different kinds of fudges), but throughout the year she’d make this concoction called Scotcheroos. I actually thought she’d invented it, although I’ve since learned that it was actually a popular recipe. For potlucks she’d make the complete version of the recipe with the melted chocolate and butterscotch chips on top, but much more often she’d make an everyday version — just the peanut butter-cereal base — for a treat, or a snack, or even a pick-me-up after a bad day. Most often she’d make it with Wheaties, and on a really bad day, she’d eat it warm out of the bowl. I always make my Scotcheroos with the melted chips — my teenage son demands it — and I use Rice Krispies rather than Wheaties. 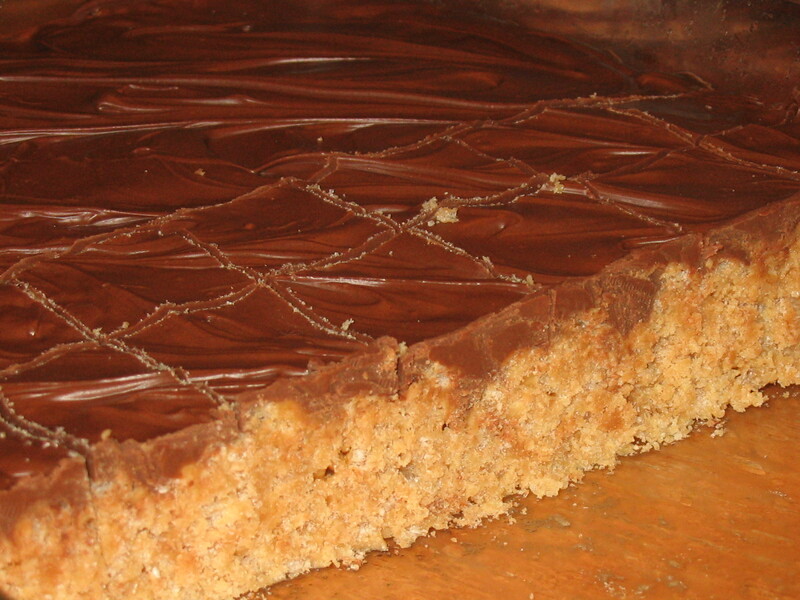 I haven’t lived with my stepmother in almost 25 years, but every time I make Scotcheroos I always think of her. Cook sugar and corn syrup in a large pot until mixture begins to boil. 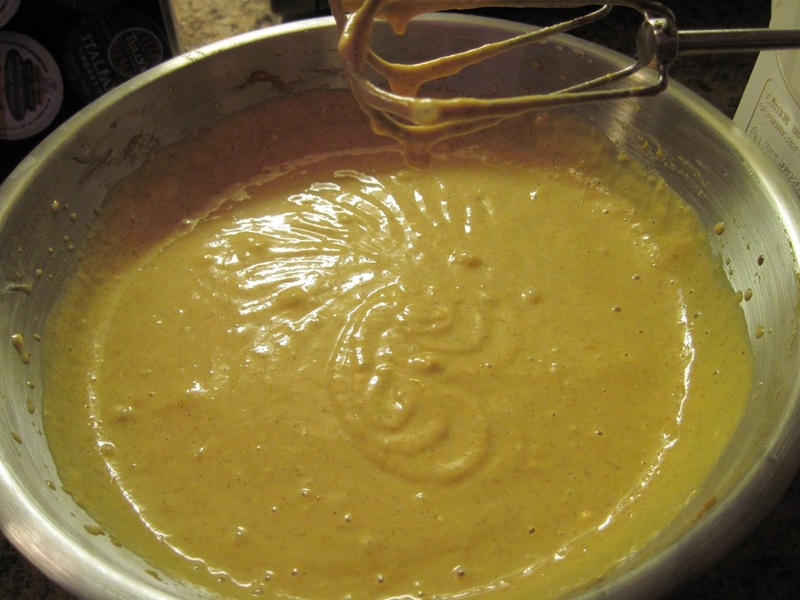 Remove from heat and add peanut butter; stir until smooth. Add the cereal and mix until all the cereal is coated. Press into a lightly greased 9 x 13-inch pan. Let harden. Melt butterscotch and chocolate chips together over hot water (or melt in microwave in glass bowl). Spread the melted chocolate/butterscotch chips over the cereal mixture. Cut into bars after top is firm.